Indexes of «Rassegna del Lazio. 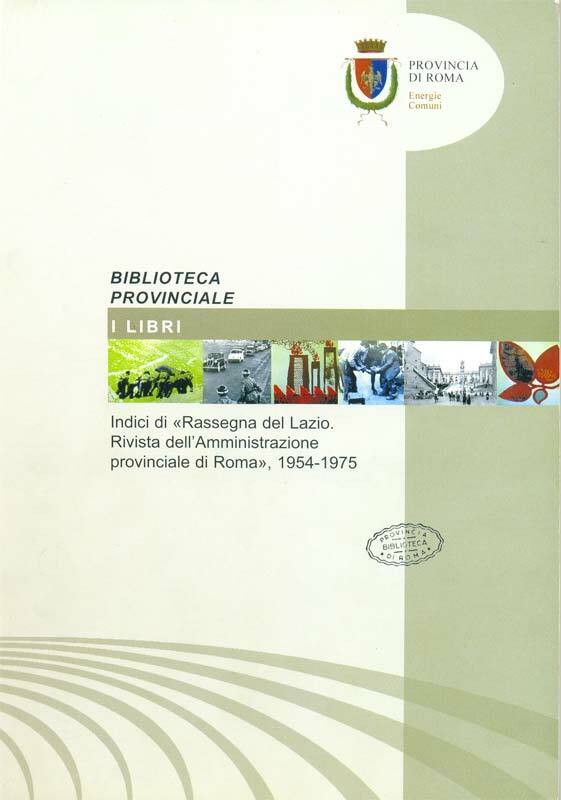 Rivista dell’Amministrazione provinciale di Roma» 1954-1975, by Rome Provincial Library, Rome, Province of Rome, 2006. For the 135th anniversary of the foundation of the Province of Rome, the Provincial Library produced the indexes of the review, in order to provide a working tool for easy access to information and material useful for studying the institutional history of the Province. Alberto Caracciolo, La storia della Provincia di Roma dall’Editto 5 luglio 1831 ai nostri giorni, first published edition by the Rome Provincial Library, Province of Rome, 2006. Publication of the typescript (1959) of the well-known professor and researcher on contemporary history. Tipografi, stampatori e librai: edizioni romane del Settecento nella Biblioteca Provinciale di Roma, by the Rome Provincial Library, Rome, Gangemi, 2006. The catalogue was drawn up for the exhibition inaugurating the World Book and Copyright Day 2006 in the context of World Book Capital. Scuola e storia locale: percorsi di ricerca sul territorio. I lavori, by the Rome Provincial Library, (Rome, Province of Rome, 2007). The volume contains the results of the works by the schools taking part in the project, with 2 DVDs attached. Scuola e storia locale: percorsi di ricerca sul territorio. Gli strumenti, by the Rome Provincial Library, (Rome, Province of Rome, 2007). The book contains the documents on the project and lessons held during the preliminary seminars for starting up the research activity.